omputational mechanics, including multiscale methods, error estimation and adaptive mesh refinement. 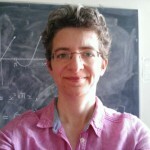 I am currently working as a lecturer in the School of Mathematics at Cardiff University. My research interests lie broadly in the field of computational mechanics. For the two-and-a-half years prior to this, I worked as a Marie-Curie Postdoctoral Fellow based at Plaxis in the Netherlands. Plaxis is a company which makes software for geotechnical engineers. Here I implemented adaptive mesh refinement in their 2D finite element solver. I was a postdoctoral research associate in the School of Engineering at Durham University (2007-2010) investigating meshless methods, and in particular, applying the Meshless Local Petrov-Galerkin method to geomechanical problems. In 2010 I was awarded the ACME UK prize for the best paper and presentation given by a postdoctoral researcher at the ACME conference that year. In 2007 I graduated with a doctorate from Cardiff University's School of Maths in computational fluid dynamics. I investigated the development of weakly nonlinear instabilities to 2D boundary layer flow.